vidnaObmana made a rare tour of the US in 2003 in support of his Spore CD. 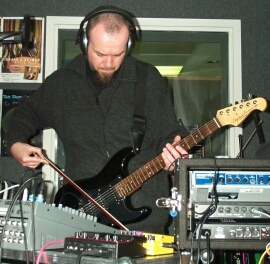 While on the east coast leg of his tour where he made Soundscapes an exclusively unique concert event, he made a stop at WDIY to play a special set on Galactic Travels (under its original name). This set included Spore-influenced music, some of which was played only on Galactic Travels (under its original name) and will never be played again. Never fear, it was all captured on tape. The Serbo-Croatian phrase "vidna obmana" means "optical illusion" which is why vidnaObmana chose it to be his musical personna. This indicates his willingness to try new processes, sounds, and musical styles. And this is further evidenced by the change from Vidna Obmana (two words) to vidnaObmana (one word), indicating a sort of artistic rebirth. One of the top three most respected and prolific composers/performers in the ambient field today, vidnaObmana's internationally acclaimed atmospheric soundscapes have made him a sought after performer and collaborator. 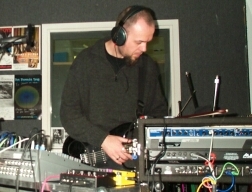 vidnaObmana is tops in the ambient field, known internationally for his atmospheric soundscapes. Eager to take risks and explore new musical territory, this adventurous artist can transport the listener to alternate worlds with a timbre shift of a synthesizer or fugara (Slovakian wooden flute). Galactic Travels (under its original name). Ambient musician vidnaObmana is one of spacemusic's brightest stars. Using synthesizers, audio processors, and a vast array of exotic instruments, this Belgian electronic musician creates a complex, layered musical journey through rhythms, timbres, loops, and sonic atmospheres. The name vidnaObmana means "optical illusion" in Serbo-Croation, a term he picked up while vacationing in Croatia during his childhood. He chose this phrase as his musical persona to illustrate how his music correlates sonically with the surreal soundscapes he creates. vidnaObmana is a prolific composer whose diverse body of work ranges from post-industrial through gently atmospheric, to tribal ambient and more. His music slowly shifts through electronic audio imagery, creating extremely personal works of atmospheric delight. Throughout his career, vidnaObmana has explored the abrasive side of electronic composition, using freeform soundscapes, international music traditions, and post-classical experimentations. His music has been released widely by many independent labels worldwide, including: Relapse, Amplexus, Extreme, Hypnos, Mirage, Multimood, Projekt and others. A significant portion of vidnaObmana's work has been realized in collaboration with some of the world's most interesting musicians such as Alio Die, Jeff Pearce, Steve Roach, Djen Ajakan Shean, Asmus Tietchens, and Brannan Lane. 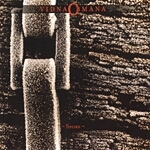 vidnaObmana's solo CD Spore is on the Relapse label. It was played on Galactic Travels (under its original name) during the Special Focus on vidnaObmana in April, 2003.